Directed by Claire Marie Vogel. From the Attention Seeker EP, out February 23 on Warner Bros. Woo hoo! New Regrettes! 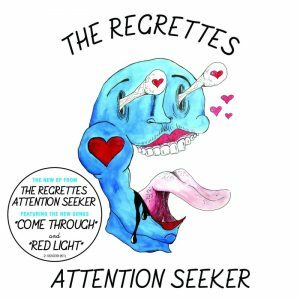 They’ve got a new EP coming out in a couple weeks with two brand new songs, a cover of Dion and the Belmonts’ “Teenager in Love,” and two acoustic versions of songs from Feel Your Feelings, Fool. I’ve made no secret that the Regrettes are my favorite new band of the moment. Lydia Night writes sophisticated pop songs and her band punches them out with precision without sacrificing any of their punk rock energy. Listen to that gnarly bass tone! They’re the best. They’re playing all the festivals this summer, so check them out if you’re going. I saw them last year at Riot Fest and I can confirm they put on a great show. The Regrettes: web, twitter, amazon, apple, spotify, wiki.